Superyacht owners cruising in the Adriatic Sea will soon have access to a full range of refit and maintenance services in the Bay of Kotor, Montenegro. The new facility will be located on 3 hectares of waterfront property, just three miles across the bay from Porto Montenegro’s marina. The facility, a partnership between the French refit company Compositeworks and the Adriatic Shipyard in Bijela, will offer a full range of services similar to those offered at the yard in La Ciotat, France. The facility is expected to begin operations in the autumn of 2010 and will also be a base for a range of specialized subcontractors. 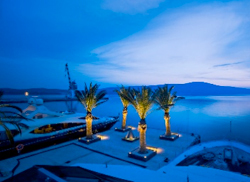 “This partnership represents a major step towards our vision of bringing the superyacht industry to Montenegro and validates our vision for Porto Montenegro,” said Oliver Corlette, managing director of Adriatic Marinas, the developer and owner of Porto Montenegro.